The songstress revealed that the Bootylicious star was almost on board for her new album of duets, but as their collaboration didn't happen, she is hoping to try again in the future. 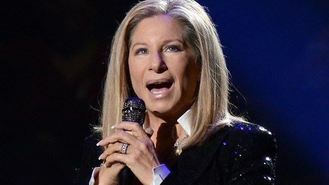 Barbra, 72, said: "She had her people try to do a track of one of the songs from my movie, A Star Is Born, and we didn't have the time to finish it, to get it right. We had to release the album. "Maybe someday we'll do a duet because she's so great." The record, Partners, features Billy Joel, Stevie Wonder, John Mayer, John Legend and Babyface, who produced the album. Other than Barbra it includes only male singers, but the star said it wasn't a conscious effort to exclude females. "Everyone we asked was ... busy," said the singer. Barbra said there were a lot of nerves in the studio as she and her guests laid down their tracks. "I love that kind of nervousness. You know something's being done for posterity. I guess that's why I like making movies, too, because it lasts."